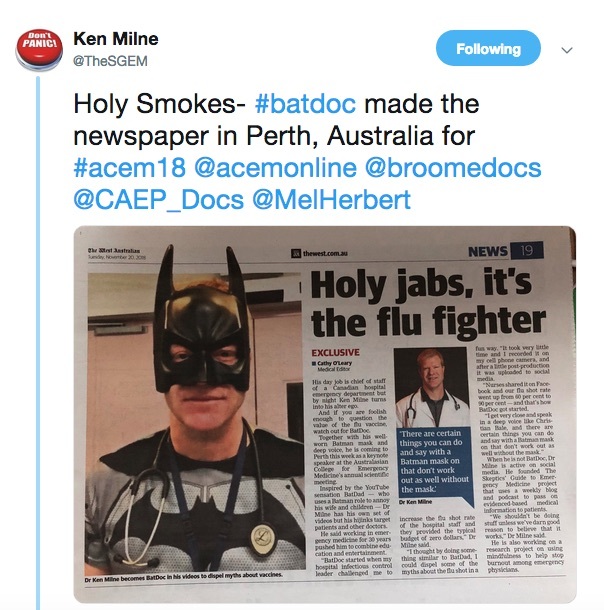 Ken Milne, AKA #BatDoc: “I’m not a superhero, even though I dress as one"
When three-quarters of people in a profession show signs of burnout, you have a problem that goes far beyond individuals to a system that is sick. 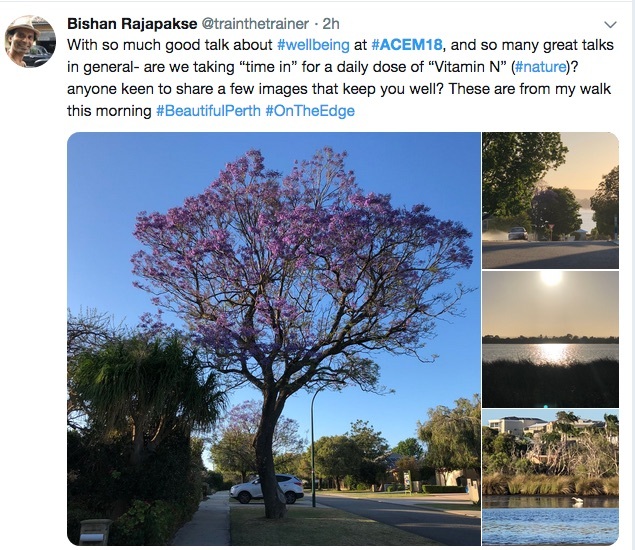 That was one of the central messages of an acclaimed keynote address to emergency doctors on the issue of mental health and wellbeing delivered at the Australasian College for Emergency Medicine’s annual scientific meeting in Perth this week. 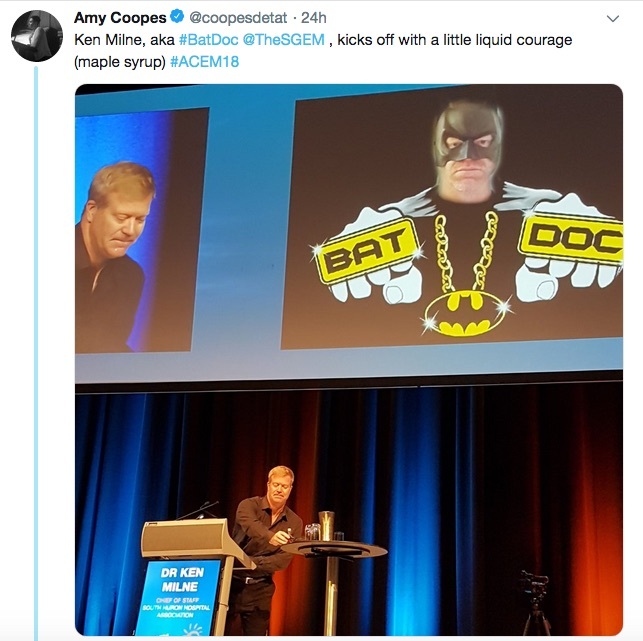 Taking to the stage in his trademark superhero mask and toting a bottle of “liquid courage” – maple syrup – Canadian emergency physician #BatDoc, Dr Ken Milne, offered some deeply personal insights into “life on the edge”: of medicine, of society, and of burnout. 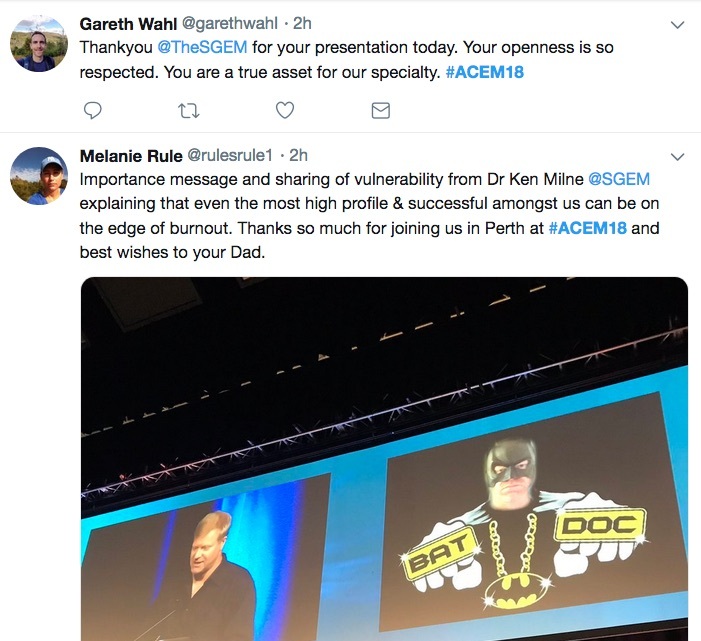 Milne, who is something of a cult figure in the online #FOAMEd community as creator of the popular site The Skeptics Guide to Emergency Medicine, said a unique mix of personal and professional factors made emergency doctors particularly vulnerable to Maslach’s triad of emotional exhaustion, depersonalisation and loss of personal accomplishment. 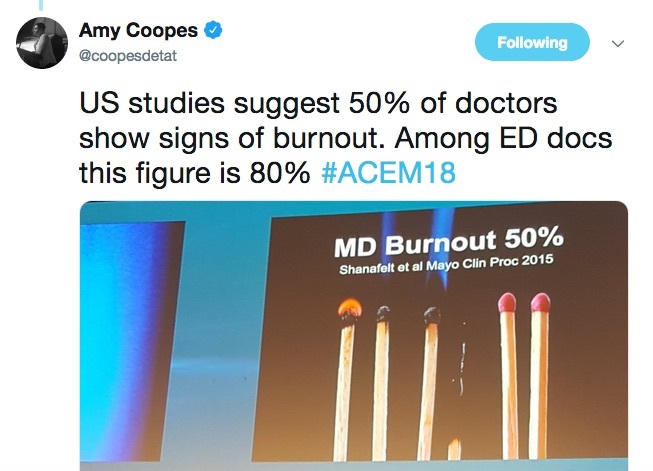 Half of all medical doctors in the United States showed signs of burnout, according to studies, and among emergency physicians this number was higher still – a whopping 70 percent, he told delegates. 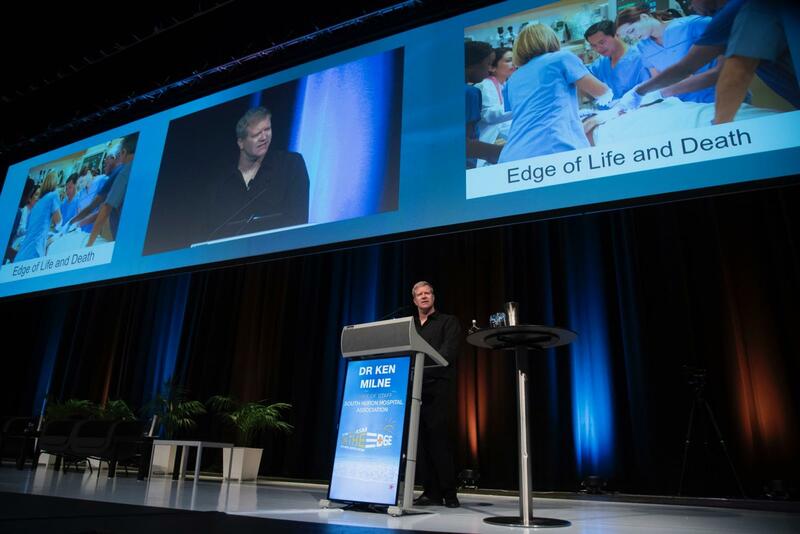 Figures are similar locally, affecting 75 percent of Australian and New Zealand emergency doctors and trainees. 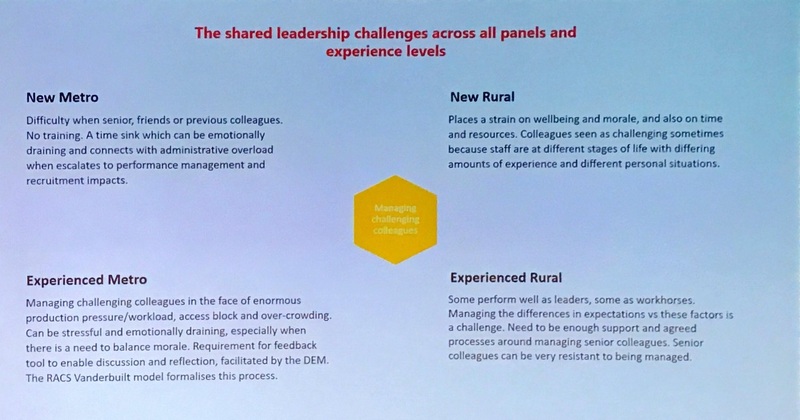 Working on the edge of life and death, with some of society’s most marginalised people, put special pressures on ED staff, said Milne. 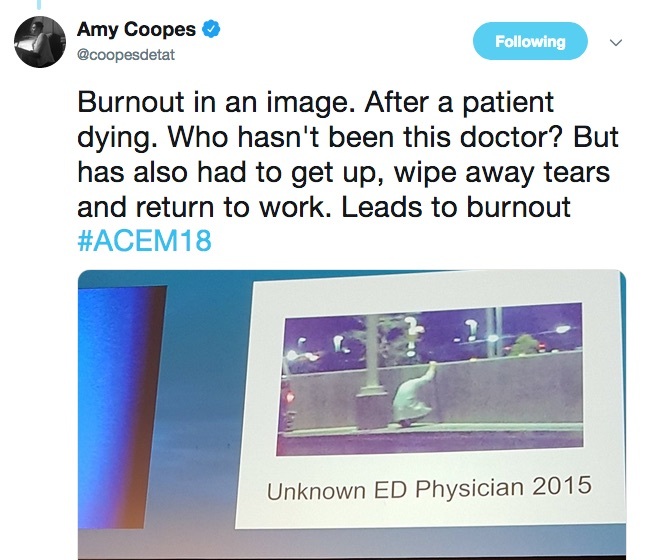 The demands of a busy department meant that there was sometimes little space or time to process the death of patient, and when emotions were chronically pushed aside, this put doctors at risk. 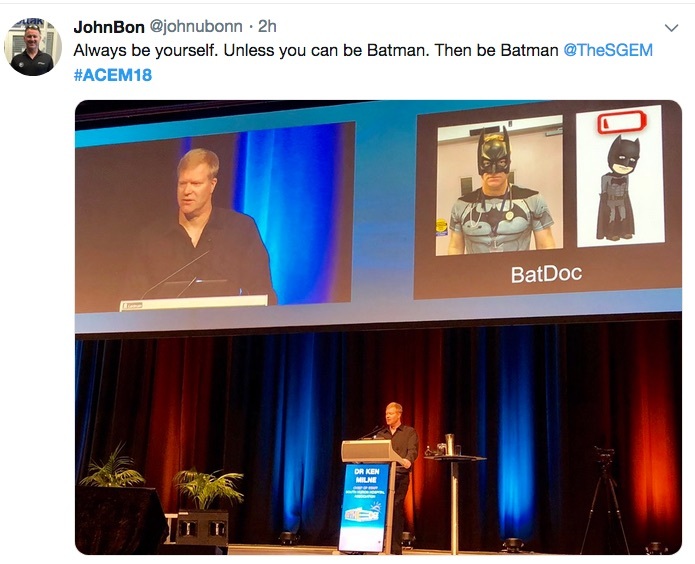 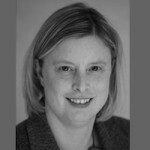 Milne said that attempting to keep up to date with the latest advances – “like drinking from a fire hydrant” – also contributed, with 3,800 biomedical papers, 75 RCTs and 11 systematic reviews being published in medicine every day. 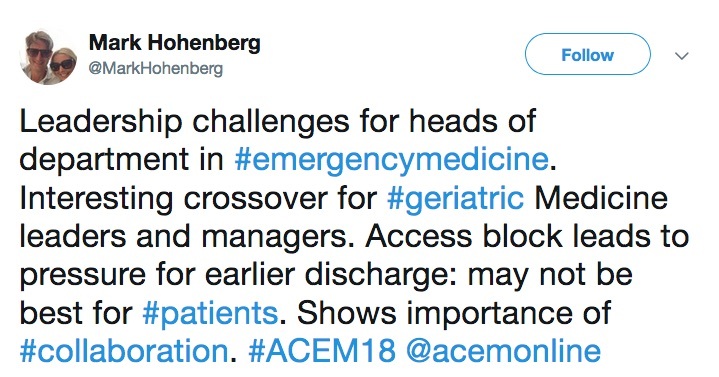 As early adopters of new technology and techniques, sometimes ED doctors got it wrong and “jumped too soon”, contributing to stress. 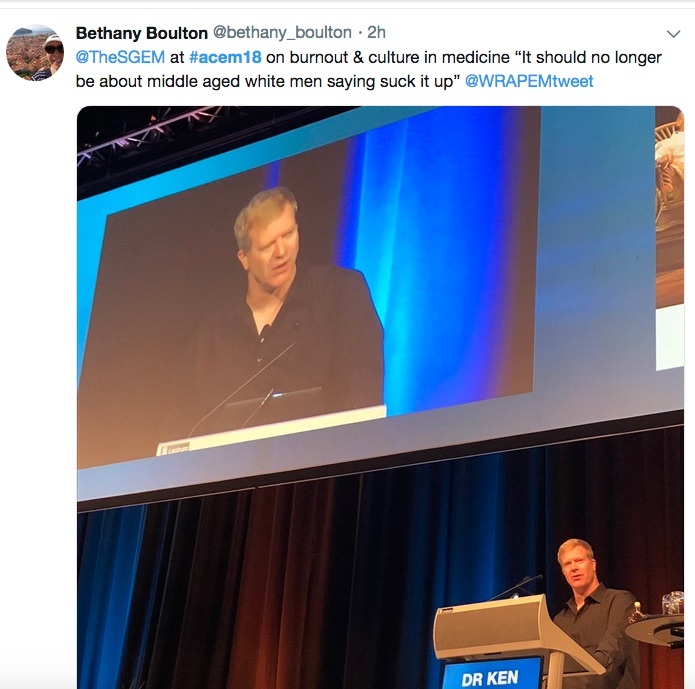 There was sustained laughter and applause in the auditorium when Milne nominated one of his chief drivers of burnout: the electronic medical record, telling delegates there was nothing healthy about placing a screen between doctors and patients. 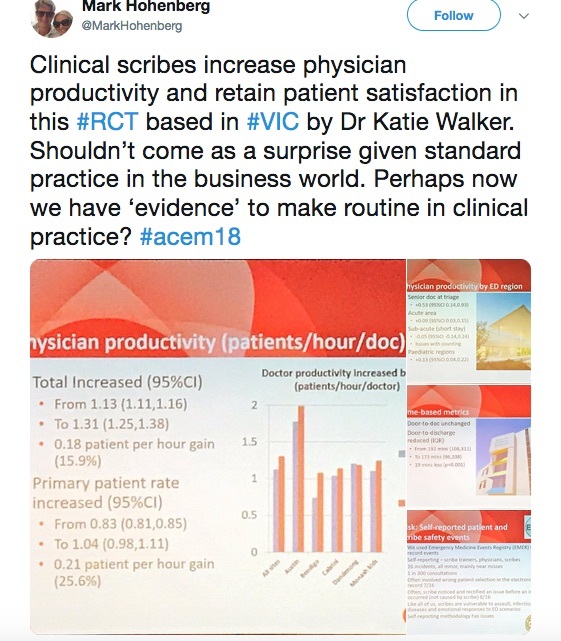 Increasingly, he said, doctors were consumed by non-clinical duties, eroding their sense of worth and satisfaction. 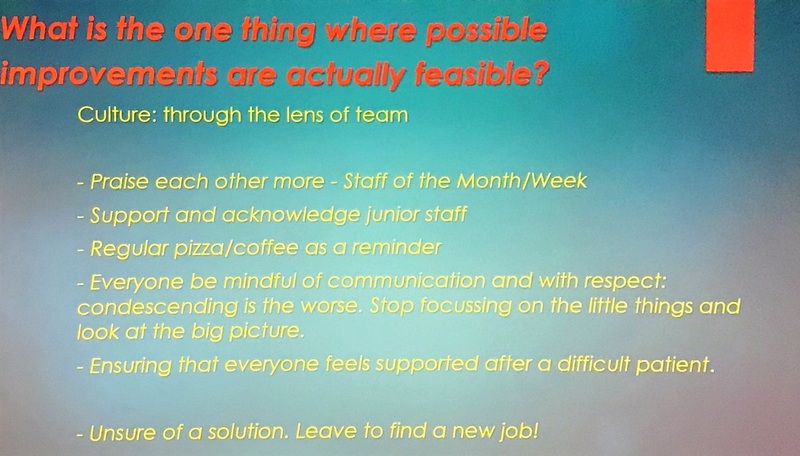 Often it’s trying to problem-solve, especially with systemic problems or problems getting access to care. 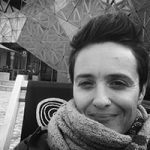 I find that I’m often dealing with not what’s the diagnosis, what’s the treatment — I’ve got the diagnosis, I know the treatment — but how can I move them through the system to get the care they need ongoing. 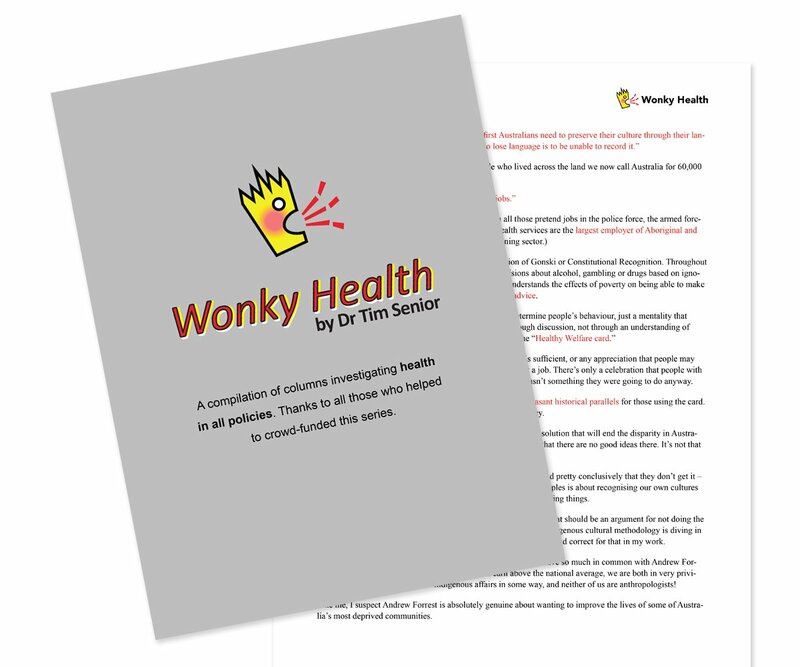 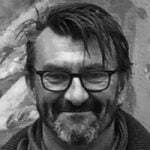 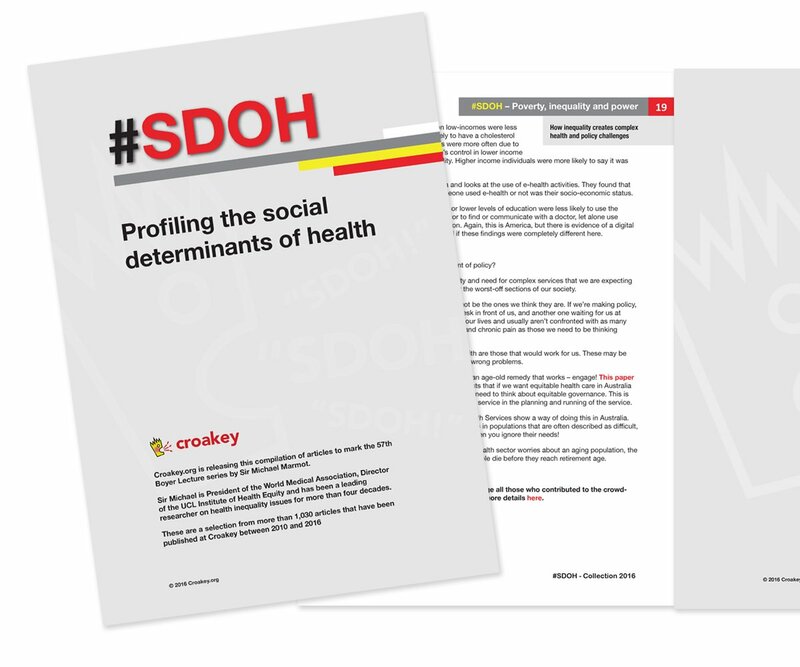 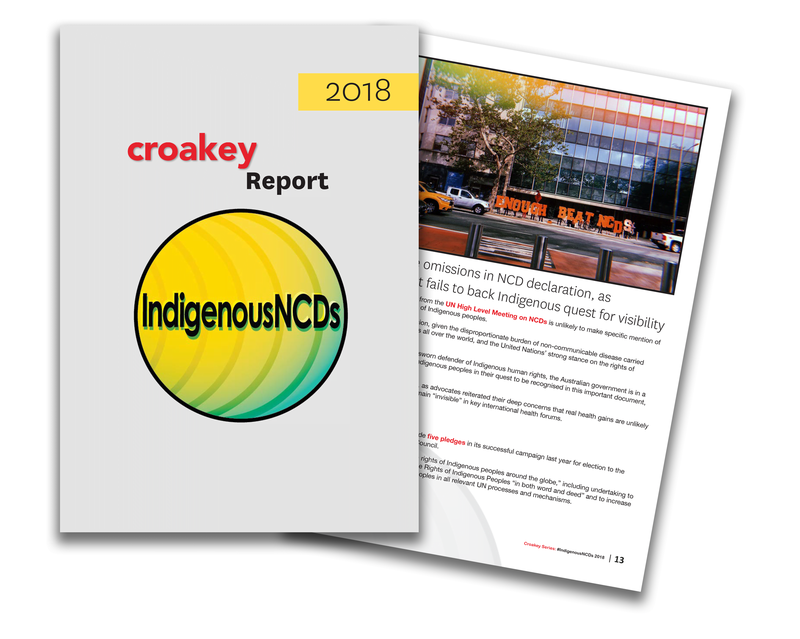 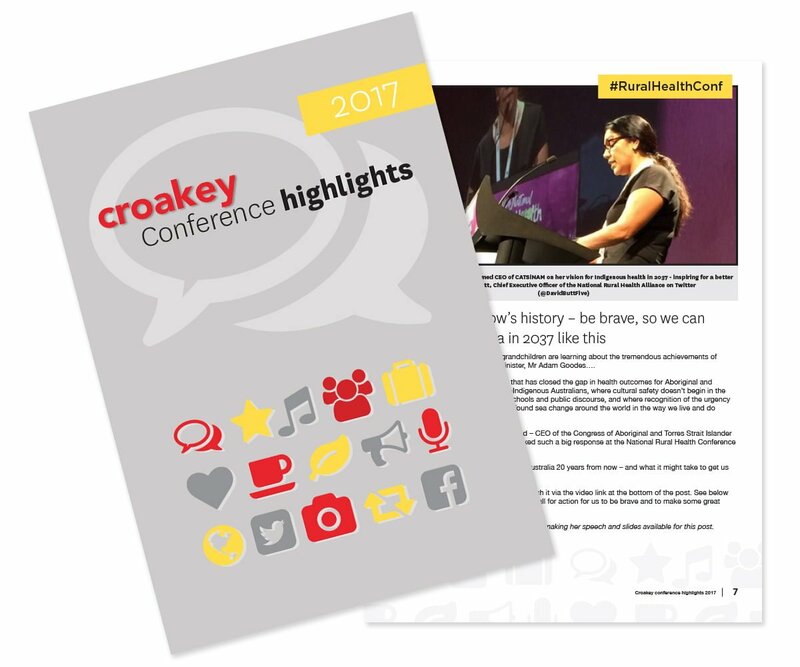 “The system plays a huge part in how we feel, how we manage our patients, our wellbeing,” he said in an interview with Croakey. 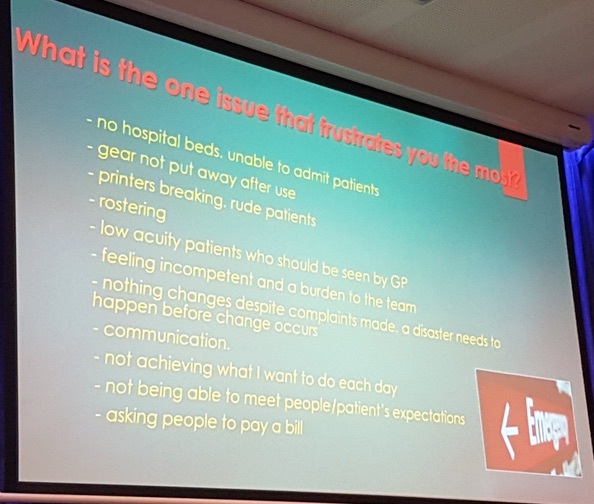 Examples like the controversial new public-private Northern Beaches Hospital in Sydney, where staff have been faced with rostering, equipment and medication shortages, were a case in point, he added. 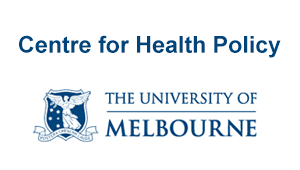 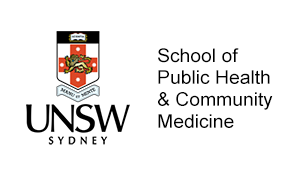 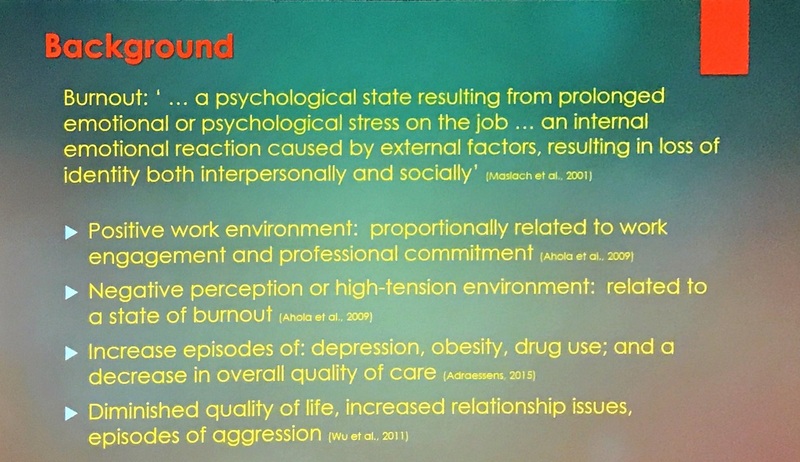 The importance of systemic issues was highlighted by research presented at the conference this week by Melanie Jessup and Frances Kinnear into the drivers of burnout among emergency doctors, looking at self-reported stressors and coping styles. 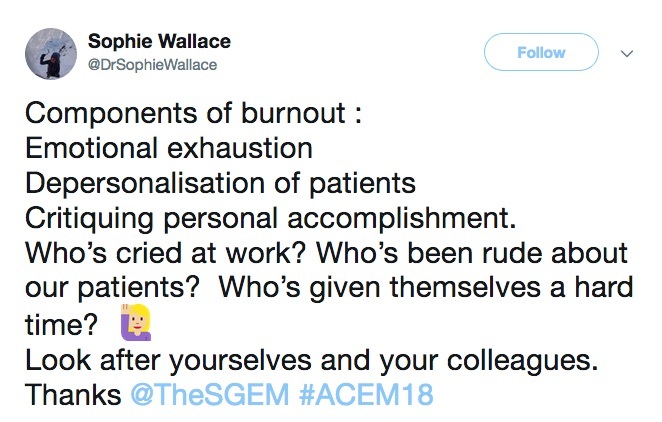 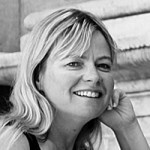 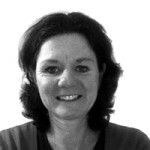 Overwhelmingly, researchers found organisational factors were central to experiences of burnout, with issues ranging from the pedestrian (printers, equipment, rostering), to cultural (communication, poor or no complaints resolution) and systemic (lack of beds, inability to admit, low acuity patients presenting to ED instead of primary care, violence and abuse). 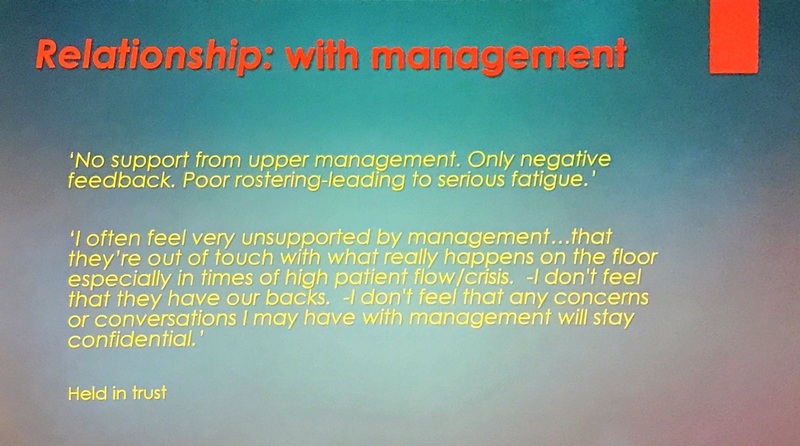 Common themes were around relationships, communication and control. 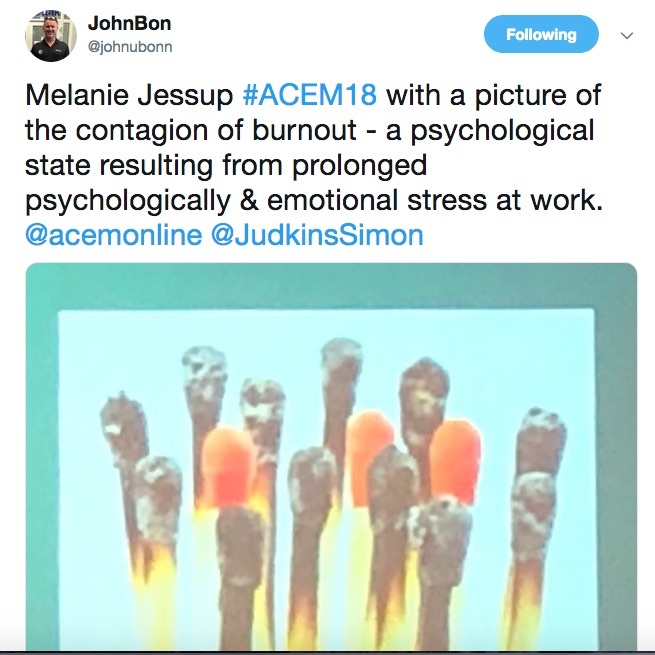 Coping styles among emergency doctors were also a contributor, with more passive (particularly evasive) approaches associated with burnout risk. 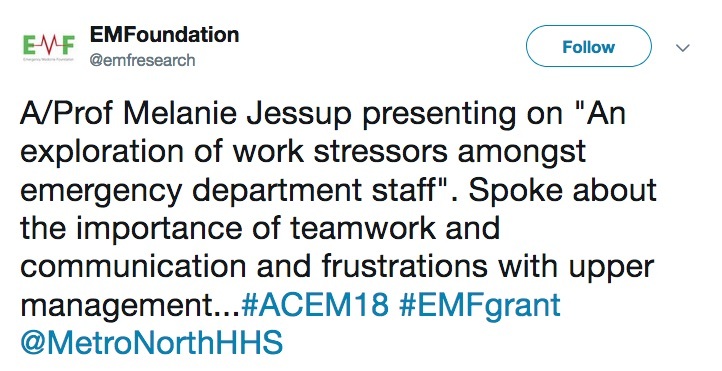 Doctors were at higher risk than their nursing or allied health colleagues, and people who were single were also more vulnerable – something to be mindful of when rostering staff at Christmas, Kinnear said. 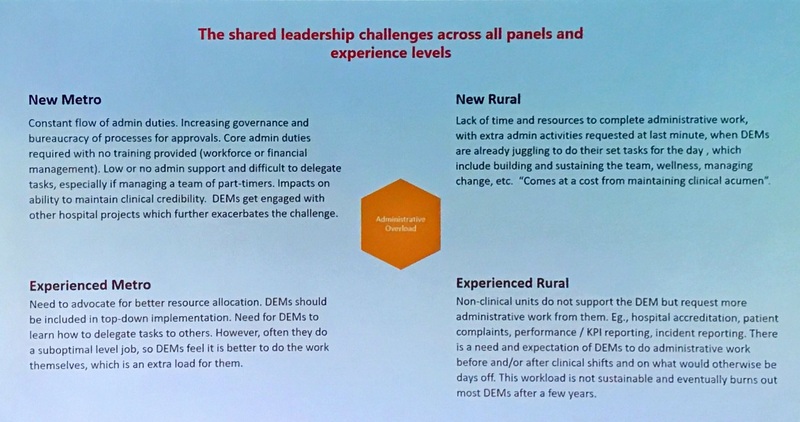 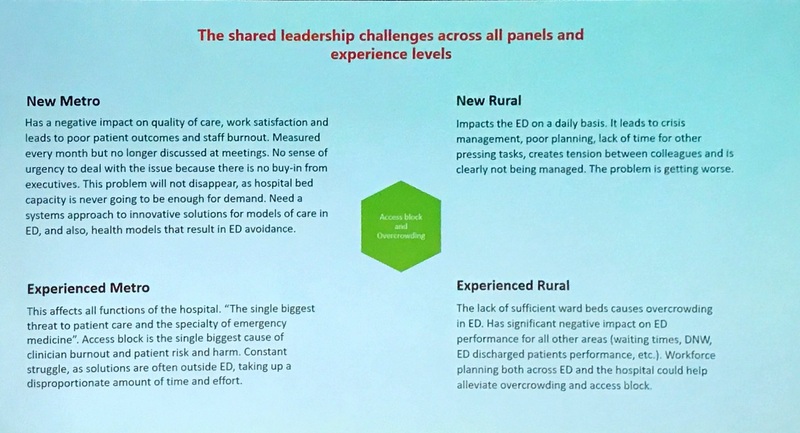 Other research presented on leadership challenges for ED directors – chief among them access block, overcrowding and managing difficult colleagues – and on the value of clinical scribes in improving productivity, offered important insights into the day to day challenges contributing to burnout in the ED. 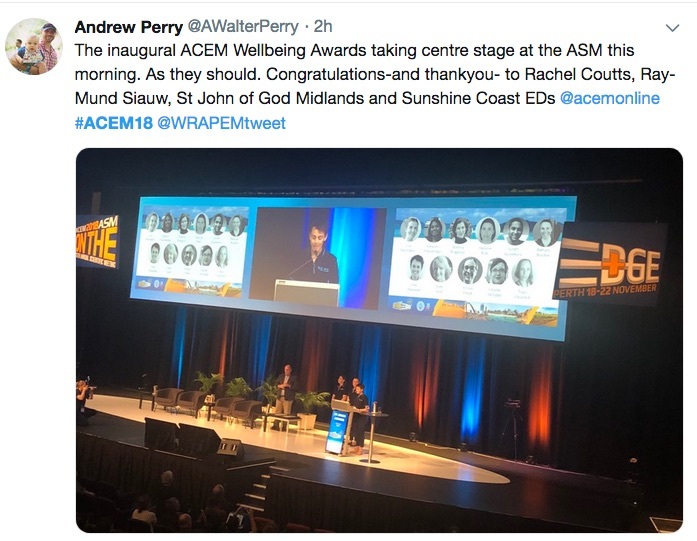 Doctors who burned out were at increased risk of depression, substance use, self-harm and suicide, and patient care was obviously at risk, Milne told delegates. 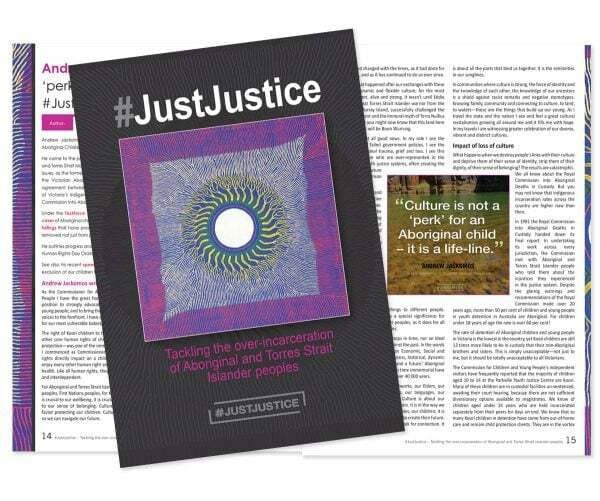 While systemic reform was unquestionably part of the equation, Milne said there was plenty individual doctors could do, starting with mindfulness, kindness and avoiding tribalism. 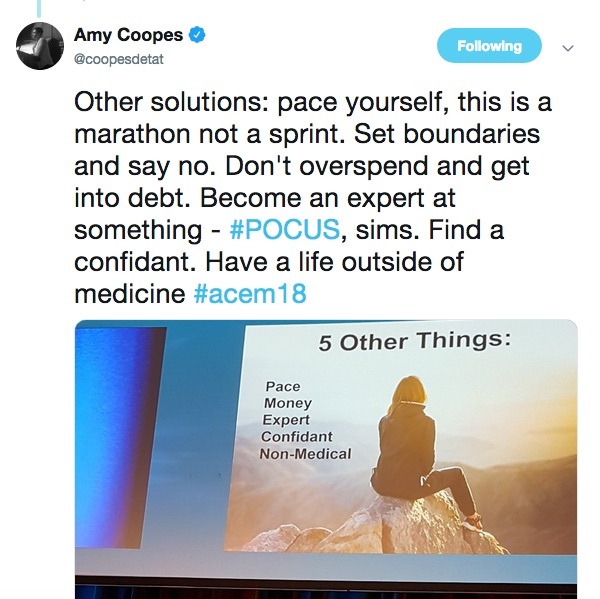 Learning to pace yourself – set boundaries, say no, don’t spend beyond your means – was important, as was filling your cup both at work (finding a niche, becoming an expert) and outside (having a confidant and interests beyond medicine). 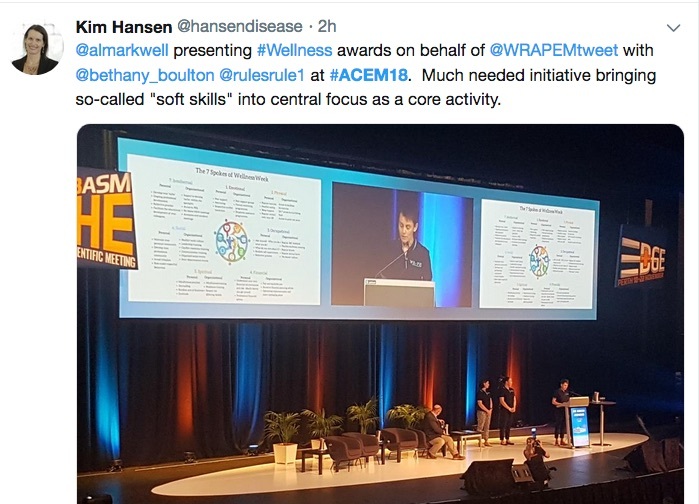 He acknowledged that stigma, shame and embarrassment prevented people seeking help when they needed it, and that cultural change would take time. 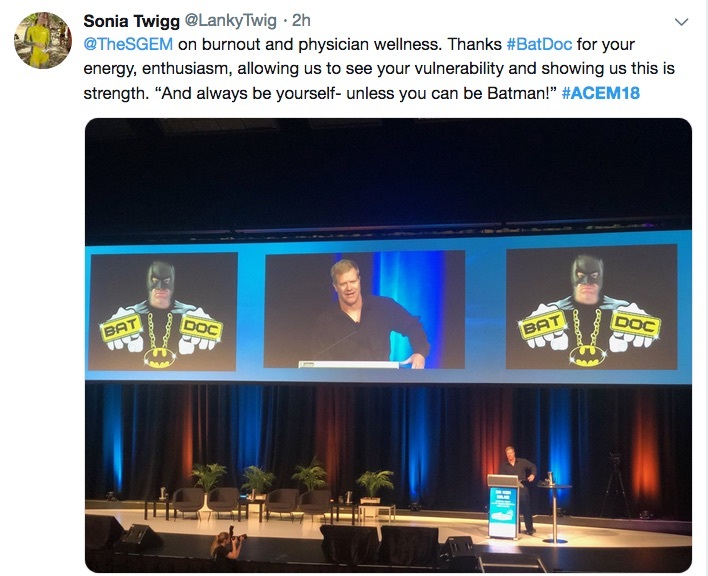 “Being a physician should be something that you do, not something that defines who you are,” he said. 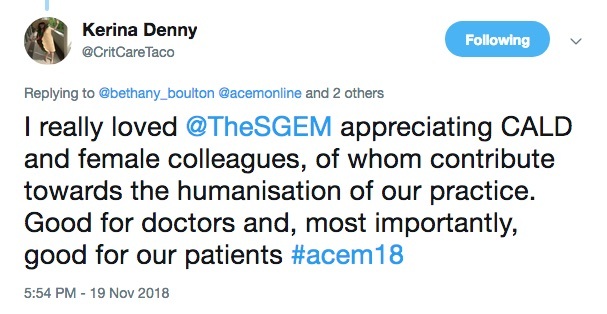 “We can have a long and successful and fantastic career… however, we should not be consumed by the practice of emergency medicine. 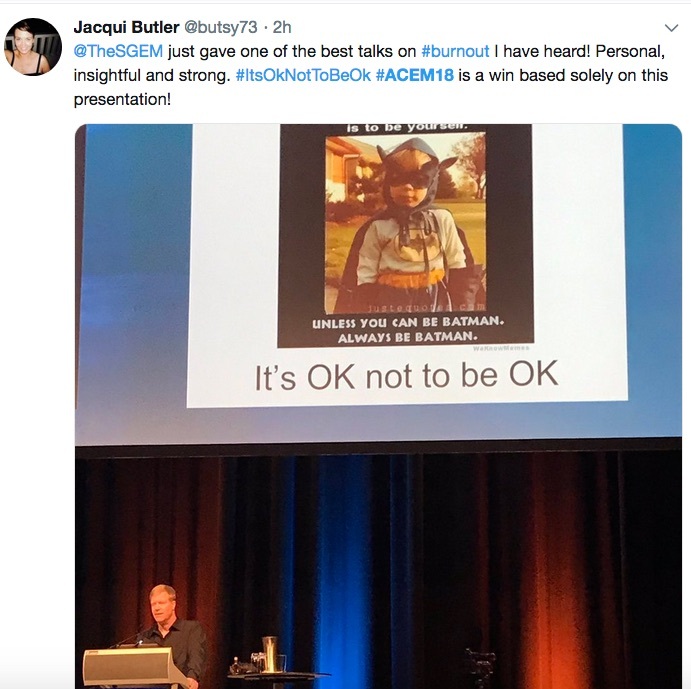 Milne stressed that when someone asked ‘are you ok’, it was ok to say ‘no I’m not ok, but I will be’. 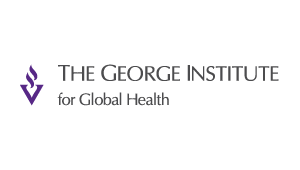 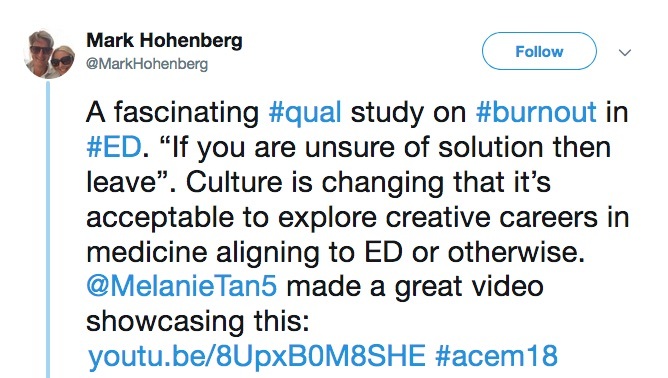 (Watch the video here, re Creative Careers in Medicine). 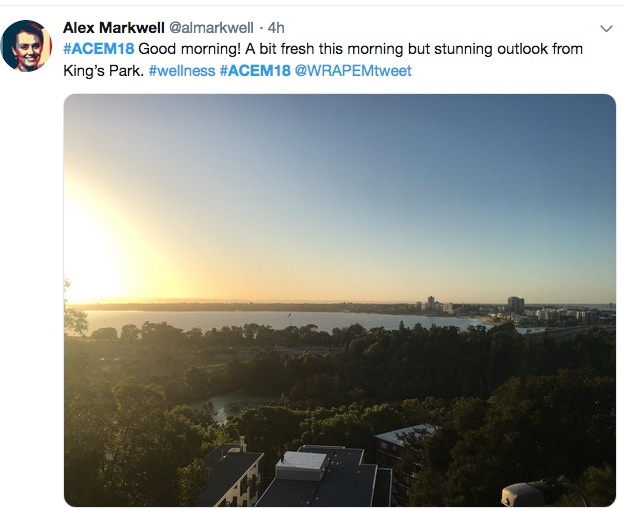 • The ACEM annual scientific meeting continues in Perth today. 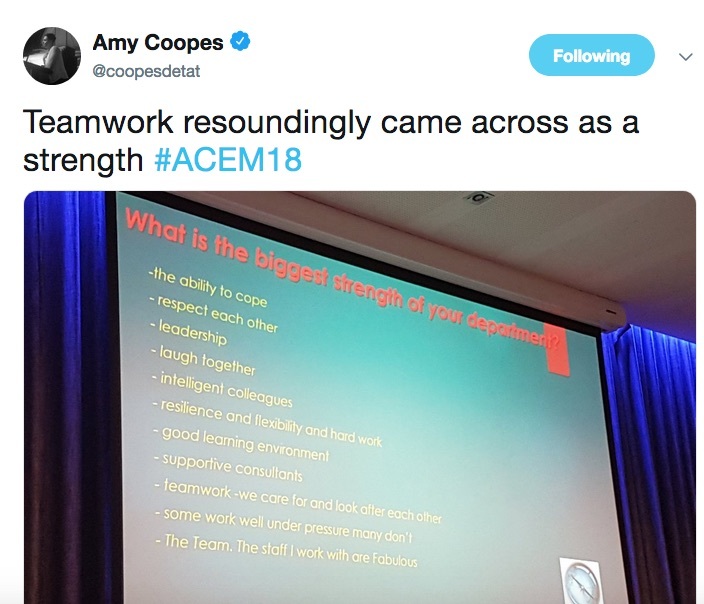 Follow @coopesdetat, @acemonline and #ACEM18 for full coverage.